Variable 2-speed 1/2 Driver-Drill delivers 480 in. Variable speed Impact Driver (0-2,300 RPM & 0-3,200 IPM) provides 1,420 in. 18V Compact Lithium-Ion 2.0Ah battery BL1820 reaches full charge in 25 minutes or less. Compatible with Makita 18V Lithium-Ion batteries with a Star symbol. 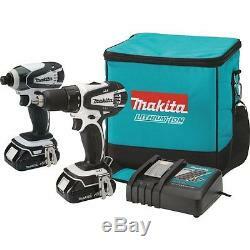 Includes Driver-Drill, Impact Driver, (2) 18V compact batteries, charger 110v and bag. This tool is FACTORY RECONDITIONED!! AN AWESOME TOOL AT AN UNBELIEVABLE PRICE! Sale goes while supplies last! Variable 2-speed 1/2 Driver-Drill (0-400 & 0-1,500 RPM) with Makita-built 4-pole motor delivers 480 in. Of Max Torque and weighs only 3.3 lbs. Of Max Torque and weighs only 2.8 lbs. 18V Compact Lithium-Ion 2.0Ah battery BL1820 provides up to 50% more run time per charge. 18V Compact Lithium-Ion 2.0Ah battery BL1820 is compatible with 18V LXT® Tools. Equipped with Star Protection Computer Controls to protect against overloading, over-discharging and over-heating. Rapid Optimum Charger communicates with the battery's built-in chip throughout the charging process to optimize battery life by actively controlling current, voltage and temperature. Rapid Optimum Charger has a built-in fan to cool the battery which helps produce more lifetime work 110v. Makita technology delivers category-leading charge time, so the battery spends more time working and less time sitting on the charger. The item "MAKITA ct200rw lithium-ion drill/driver & impact driver combo 18v 18 volt withwrnt" is in sale since Sunday, May 28, 2017. This item is in the category "Home & Garden\Tools\Power Tools\Combination Sets". The seller is "discounttoolmall" and is located in Chapman, Kansas. This item can be shipped to United States, Canada, United Kingdom, Denmark, Romania, Slovakia, Bulgaria, Czech republic, Finland, Hungary, Latvia, Lithuania, Malta, Estonia, Australia, Greece, Portugal, Cyprus, Slovenia, Japan, China, Sweden, South Korea, Indonesia, Taiwan, Thailand, Belgium, France, Hong Kong, Ireland, Netherlands, Poland, Spain, Italy, Germany, Austria, Russian federation, Israel, Mexico, New Zealand, Philippines, Singapore, Switzerland, Norway, Saudi arabia, Ukraine, United arab emirates, Qatar, Kuwait, Bahrain, Croatia, Malaysia.